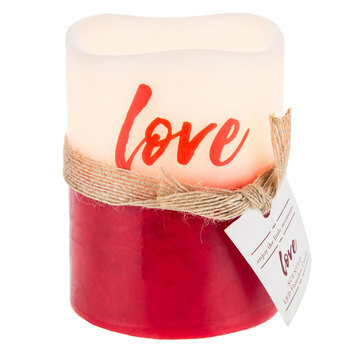 Infuse your charming space with the fresh, fragrant scent of Blushing Petals Love LED Candle. Outfitted with a flameless LED flame, this lovely candle offers a scent of blushing petals with a red and cream wax finish. A burlap ribbon is tied across the center, and a red "love" text design is contrasted against the beautiful cream top. Incorporate it into a fun centerpiece or shelf for a simple pop of scented beauty.